Get ready to be amazed and captivated by Rain Falling Up, a Dumbworld Production in collaboration with Ulster Orchestra, Ulster Hall, Friday March 16. Guaranteed to be a joyous concert for all the family, this spectacular musical production features a large chorus of 300 children from local schools in Belfast, the Ulster Orchestra and a live shadow puppet animation - all created with the support of world renowned film-maker, director and writer John McIlduff and composer Brian Irvine. Brian Irvine composer of Rain Falling Up and Creative Director of Dumbworld Production and school children from primary schools in Belfast including; St Kierans, Scoil An Droichead, Holy Rosary, Victoria Park, Currie P.S, Donegall Rd, St Teresas, Harding Memorial and Holy Family get ready to amaze and captivate audiences at the musical spectacle Rain Falling Up. Combining music, song, narration and animation, Rain Falling Up, produced by Dumbworld in collaboration with the Ulster Orchestra and supported by National Lottery funding through the Arts Council of Northern Ireland, tells the story of a little boy Jake, who is fascinated by all things scientific. One day, after being blamed for breaking his mum’s vase he comes to the conclusion that gravity is not his friend anymore. So he builds himself a gravity switch so he can turn gravity off. Life seems so much more fun when you can float around freely, but when the switch disappears and Jake finds himself drifting alone through the universe he realises that perhaps he made a mistake. Rain Falling Up was first performed in the Waterfront Hall in 2010 with the Ulster Orchestra and has since been performed in Dublin, City of Derry and in the Italian city of Aosta, each time with a different orchestra and children’s choir. In 2013 Rain Falling Up, was nominated for a British Composers Award (community award). 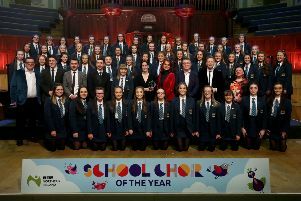 The current project has been running since November 2017 involving a specially formed children’s chorus made up of 300 primary school children drawn from 10 schools across Belfast. During the project children will have taken part in 130 workshops including; animation, developing music, performance, learning, composition and singing skills led by Brian Irvine, the Dumbworld creative team and members of the Ulster Orchestra. Alongside these workshops the schools engaged in an art project focusing on the invention of their own gravity switches which will culminate in an exhibition of their work. Looking forward to the performance at Ulster Hall, Creative Director of Dumbworld Production, and writer of Rain Falling Up, John McIlduff said; “On behalf of Dumbworld Production we are delighted to be bringing Rain Falling Up back to Belfast. Rain Falling Up is a joyful avalanche of orchestra, animation, narration and 300 singing children – a roller coasting rollicking ride that tells the uplifting story of one boy’s struggle with the ups and downs of gravity. Rain Falling Up bursts at the seams with hope, adventure, celebration and big unapologetic tunes. Watch out for the creaky, dancing Grandfather, the flocks of flying penguins and watch out for the black holes. Rain Falling Up takes place at Ulster Hall on Friday March 16 at 7.30pm. Tickets are £12, senior citizens and children (5 years-16 years) £5, and children under 5 go free. For further details visit www.ulsterhall.co.uk or www.dumbworld.com.